There is a lot of buzz in industry literature about how underwriting profit is increasingly an essential profit source, with investment returns on capital so low. There is a lot of buzz in industry literature about how underwriting profit is shrinking towards zero as the soft market unleashes competitive forces on underwriters. Both these aspects of underwriting profit are due to the same overall reason: the increase of capital coming into the industry. The low rates of return on capital around the world is drawing more-and-more capital into the insurance industry due to the relatively strong returns on offer. 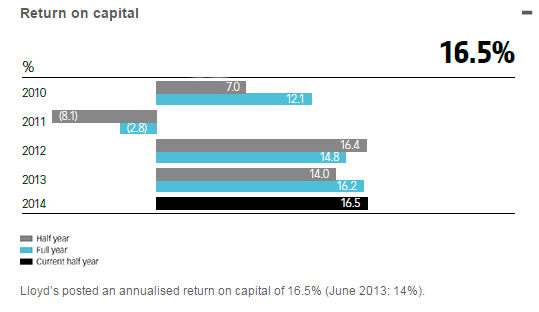 Below is Lloyd’s Return on Capital for 2010 – 2014 illustrating what is attracting all that capital. This compares to bond returns barely above zero all over the world. As that capital adds capacity to the industry, the competition for premium is increasing. While underwriters are seeing their market soften and rates get pressed lower, they are also depended upon to deliver profitable underwriting. This is particularly true with property underwriting, since it is viewed as a short-tail investment (only typically a year between applying claims to premium), meaning the lower rates of return on capital are a tactical issue instead of a long-term strategic issue (like worker’s comp and stuff). 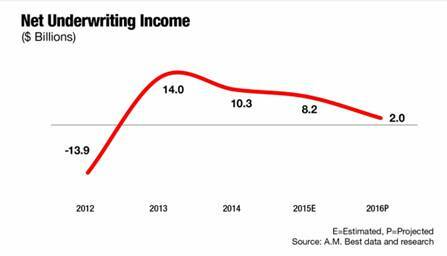 It’s a “wet noodle” chart – never a good shape for an income chart. Simple extrapolation projects a net underwriting loss in 2017. So, what can underwriters do? Increase their automation and efficiency. Expand the risks they cover, and where they cover them. These are both ways to reduce underwriting leakage, which leads to more profit. Automation includes configurable analytics (like Risk Scoring) to evaluate and rate submitted risks more quickly and easily. Meanwhile, the Protection Gap should be the first place property underwriters look for when expanding their business, because the gap is comprised of either risks they already handle elsewhere, or new risks in a market territory they are already active. Either way, it’s easier than starting something new somewhere new. Underwriting is the fulcrum of the insurance system – it’s where risk is converted to currency. Likewise, it’s increasingly becoming the portal to success, or reason for failure, for insurers. More than ever, effective underwriting is going to be the hallmark of successful insurers, and it is essential that underwriters are equipped with the necessary tools and market opportunities to drive that success.